Rev. 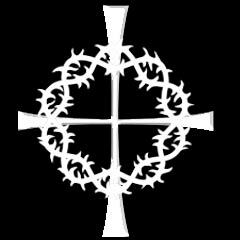 Patrick G. Cahill, CSV, died Tuesday the 5th of February 2002, at the age of 69. Fr. Cahill was born in Chicago, Illinois on July 24, 1932. He was the son of the late William Francis and Bernadine Catherine Smith Cahill. He is survived by a brother, Dr. William F. Cahill of Glen Ellyn, Illinois and a sister Mrs. Maureen Kinnavy of Stevensville, Michigan. Fr. Cahill professed First Vows as a Viatorian on August 15, 1951, Final Vows on August 15, 1954 and was ordained a priest by Bishop Raymond P. Hillinger at St. Mel Church in Chicago on June 9, 1962. Fr. Cahill was a graduate of Fenwick High School, Oak Park, Illinois and St. Ambrose College, Davenport, Iowa, where he received a B.A. in history (1951-54). He earned his M.A. degree in education from Eastern Illinois University in 1960. He attended the Viatorian Seminary, Evanston, Illinois from 1958-61 and concluded his seminary studies at the Viatorian Seminary, Washington, D.C. in 1962. During his ministry, Fr. Cahill served the Church as an educator, administrator and parish priest. His first assignment as a Viatorian Brother was Cathedral Boys High School, Springfield, Illinois, (1954-58), where he served as a teacher and club moderator. Upon returning from ordination, Fr. 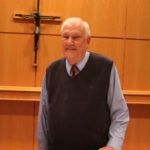 Cahill began his career at St. Viator High School, where he served as teacher, Athletic Director, and President (1974). He was also appointed Assistant Provincial and served on the Provincial Council from 1969-74. From 1979-88, he was the Athletic Director at the University of San Diego. 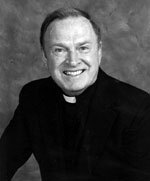 From 1988-90, he served as a counselor at Bishop Gorman High School and assisted at Guardian Angel Cathedral, Las Vegas, Nevada. In 1990, he was named Rector at Guardian Angel Cathedral. In 1996, Fr. Cahill was named Pastor of St. Jude Church, Rochester, Illinois, where he resided at the time of his death. Visitation took place at St. Jude Church in Rochester, Illinois on Friday, February 8, 2002 from 2:00 – 7:00 p.m. The funeral liturgy was celebrated following the visitation at St. Jude Church at 7:00 p.m. An additional visitation took place at St. Viator High School, 1213 E. Oakton Street, Arlington Heights, Illinois on Sunday, February 10, 2002 from 2:00 – 5:00 p.m. The Mass of Resurrection was celebrated on Monday, February 11, 2002 at 10:00 a.m. at St. Alphonsus Church, 411 N. Wheeling Road, Prospect Heights, Illinois. Following the Mass of Resurrection on Monday, burial was in the Viatorian Community plot at Queen of Heaven Cemetery, Hillside, Illinois. Please remember our brother Pat in your Masses and your prayers.